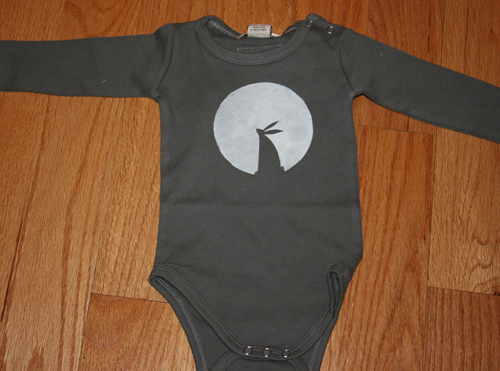 This is my favorite of the onesies I've done this month! It's another freezer paper stencil based on a drawing I did earlier this year. I can't wait to put Annabelle in it! I'm glad AEDM pushed me to try this out. I'd like to do more! leah so cute and way cool! Absolutely awesome! Very neat work. I agree, my favourite too! Love it!! Very cute, very baby chic. yep, this one rocks! do they come in my size? Judean, I was just thinking if this was adult size I would soooo wear it! Super cute, Leah! So sweet! When my son was little, I loved onesies, but there were never cute ones like this and I never thought of making my own. What a great idea! beautiful! you’ll have to start making these for sale! oh, my!! this is so, so sweet!!! do you have a tutorial on how you did it?? i’m SAD this is the next to last day for AEDM. many thanks for hosting it! That is such a cute onesie! I love the simple rabbit silhouette looking up at that big old moon!